The average body mass for adult males is around 3 kilograms, and for females it is around 2 kilograms. 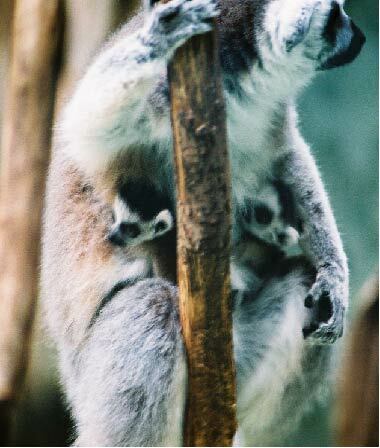 Like the true lemurs this species has a rhinarium and binocular vision. Has a long and bushy tail that has rings on it, that is used in visual displays. This species is found in Madagascar, and it inhabits a multitude of habitats. The main diet of the ring-tailed lemur consists of leaves, flowers, and insects. This is a semi-terrestrial species. The ring-tailed lemur is a diurnal species (Fleagle, 1988). Group sizes range from 5 to 22 individuals (Richard, 1985). This species moves quadrupedally along the forest floor. This species lives in large groups composed of both males and females, with the males most likely to disperse, thus having female philopatry. The females are dominant in the group. All adult females participate in the raising of the offspring of the group, and sometimes the males participate also. In groups of under 10 individuals it has been found that non-linear hierarchies exist (Nakamichi and Koyama, 1997). Also females with relatives in a group spend more time interacting with their relatives, than females without relatives who spend more time alone as opposed to spending time with non-relatives (Nakamichi and Koyama, 1997). Female ring-tailed lemurs are more active in intergroup confrontations with conspecifics than males (Nakamichi and Koyama, 1997). There is a dominance hierarchy amongst the males, but this does not seem important during mating season because even low-ranking males are able to copulate (Richard, 1985). infant contact calls: this sound consists of a soft purr. cohesion call: this is used when the group is widely dispersed and sounds like a cat's meow. territorial call: this call sounds like a howl, and may be heard for up to a kilometer. alarm call: this call starts out as a grunt then becomes a bark. repulsion call: this call is a series of staccato grunts sounds, and occurs between two individuals. As in all true lemurs, olfactory communication is important for the ring-tailed lemur. tail-flick: this is where secretions from the wrist glands are rubbed on the tail and flicked at an opponent. staring open-mouth face: This is where the eyes are opened wide, the mouth is open with the teeth covered by the lips (Jolly, 1972). This occurs when mobbing a predator or serves to communicate an inhibited threat (Jolly, 1972). staring bared-teeth scream face: This is where the eye are opened wide, the mouth is open with the corners drawn back so that the teeth and gums are revealed (Jolly, 1972). This display occurs with terror flight (Jolly, 1972). silent bared-teeth face: This is where the eyes are staring at the stimulus, the eye brows are either relaxed or up, and the corners of the mouth are drawn back allowing the teeth to show (Jolly, 1972). This is used to communicate submission or a friendly approach (Jolly, 1972). bared-teeth gecker face: This is like silent bared-teeth face only with a rapid noise attached to it (Jolly, 1972). This display occurs during subordinate flee-approach conflicts and also when an infant is bothered (Jolly, 1972). pout face: This is where the eyes are opened wide and the lips are pushed forward such that the mouth resembles an "O" shape (Jolly, 1972). This occurs with contact calls and also occurs with begging (Jolly, 1972). hoot face: This is where the lips are pushed forward to resemble something called a "trumpet-mouth" (Jolly, 1972). This dispaly occurs with long-distance calls (e.g. territorial calls) (Jolly, 1972). social grooming: This is where one individual grooms another for parasites with their grooming comb, which is the lower inscisors. This is used to reinforce social bonds between individuals and within the group. This species usually gives birth to a single offspring, but twins may occur. During estrus the perineum of the female swells up and turns pink (Evans and Goy, 1968). presenting: The female will present her hindquarters to a male as a sign of sexual solicitation (Evans and Goy, 1968). Evans, C.S. and Goy, R.W. 1968. Social Behaviour and Reproductive Cycles in Captive Ring-tailed Lemurs (Lemur catta). J. Zool. Lond., Vol. 156, 181-197. Jolly, A. 1972. The Evolution of Primate Behavior. Macmillan Publishing Co., NY. Richard, A.F. 1985. Primates in Nature. W.H. Freeman and Co.
Last Updated: January 28, 2007.